Your access to and use of this site is subject to the following terms and conditions and all applicable laws. By accessing and using this site, you will be deemed to have agreed to the following terms and conditions. All the information and material provided on this website is solely for illustrative purposes. It is not intended to and does not create any business, contractual or employment relationship with eleQtra (InfraCo) Limited or its affiliates or connected parties (collectively referred to herein as “eleQtra”). All the information, contents, text and images, including but not limited to source code, photography and buttons, is the property of eleQtra and/or Deviate Ltd, and may not be copied, reproduced, republished, posted, transmitted or distributed in any way without the express, advance, written consent of eleQtra. The information on this site is provided free of charge and for informational purposes. It does not create a business, employment or professional services relationship between you and eleQtra. Information and other materials posted on this site are not intended to amount to advice on which reliance should be placed. eleQtra therefore disclaims all liability and responsibility arising from any reliance placed by any visitor to the site or anyone who may be informed of any of its contents. If you wish to make any use of material on this site other than that as set out above, please address your request toinfo@eleQtra.com. Links on this site may lead to services or sites not operated by eleQtra. No judgment or warranty is made with respect to such other services or sites and eleQtra takes no responsibility for such other sites or services. A link to another site or service is not an endorsement of that site or service. You may link to the home page of this site, provided that you do so in a way that is fair and legal and which does not damage the reputation of eleQtra or take advantage of it. In particular, you must not establish a link in such a way as to suggest any form of association, approval or endorsement on the part of eleQtra where none exists. This site must not be framed on any other site, nor should you establish a link to any part of this site other than the home page. eleQtra reserves the right to withdraw linking permission without notice. This site is provided “as is” and eleQtra expressly disclaims all warranties of any kind, whether express or implied, including any warranties of merchantability or fitness for a particular purpose. In no event shall eleQtra or any of its employees or contractors be liable for any damages whatsoever in connection with the information or material on this website, including but not limited to actual, consequential, direct, exemplary, incidental, indirect, punitive or special damages. The English Courts will have exclusive jurisdiction over any claim arising from or related to a visit to or the contents of this website. English Law will apply to these terms and conditions. If you have any concerns about material that appears on this site please contactinfo@eleQtra.com. 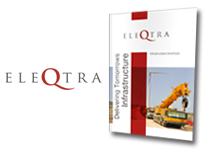 eleQtra (InfraCo) Limited is a private company registered in England and Wales with registered number 5390107.